Hoops chairman insists the club will try their best to host games with Spurs, PAOK and Rubin Kazan in their own ground. 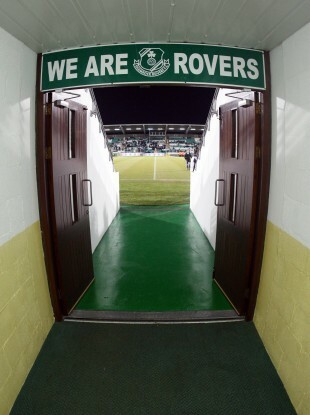 SHAMROCK ROVERS WILL attempt to keep their Europa League group stage games in Tallaght. The Hoops beat Partizan Belgrade on an historic night for Irish football last night in a second-leg play-off. This afternoon the Airtricity League champions were drawn in a pool with English Premier League giants Tottenham Hotspur, Russian side Rubin Kazan and PAOK of Greece. There had been some expectation that the ties would be switched from the club’s home ground of Tallaght to the Aviva Stadium. But club chairman Jonathan Roche says Rovers are working to ensure the glamour ties are hosted in their own stadium. When asked by presenter Matt Cooper on Today FM’s Last Word programme if the Spurs game would be moved to Lansdowne Rd, Roche answered: “No, no, no… not necessarily, we’re going to try to to play all the games in Tallaght. “We are working with the FAI and UEFA with a view to holding our games at Tallaght. Currently we have 6,000 [seats in Tallaght] but we’re hoping to put in extra seating to put it at 10-12,000. We’ve had Juventus, we’ve Real Madrid, we’ve had big matches at Tallaght and it’s our home ground. “And you can’t play one match in one place and one in an other, but we hope to play our matches in Tallaght. So we’ll try our best, if not we’ll have to talk to the Aviva. Rovers booked their place in dramatic fashion – with an extra-time penalty sealing the victory. Hours later, the chairman was on his way to Monaco for the group stages draw. “It was a great night for the league, the country and Irish football. I think Irish clubs have been knocking on the door and I’m just glad that we’re the ones that have opened it. Hopefully now this will give more credit to the league in the eyes of the general public because we have really good players in it. “We didn’t presume that we’d get through – after last week’s first leg we thought we’d have a 30% to 40% chance of maybe beating them because we done so well in the second half. And obviously we didn’t book anything so we left out hotel room at four o’clock this morning, flew to Munich and waited for connection to Nice. “So we get to Nice at around half two and missed the draw. I got it on the phone on the way in to Monaco but we were there for the important bit – the workshop and to arrange the fixtures. Email “Rovers chief: we'll try to keep Europa clashes in Tallaght”. Feedback on “Rovers chief: we'll try to keep Europa clashes in Tallaght”.